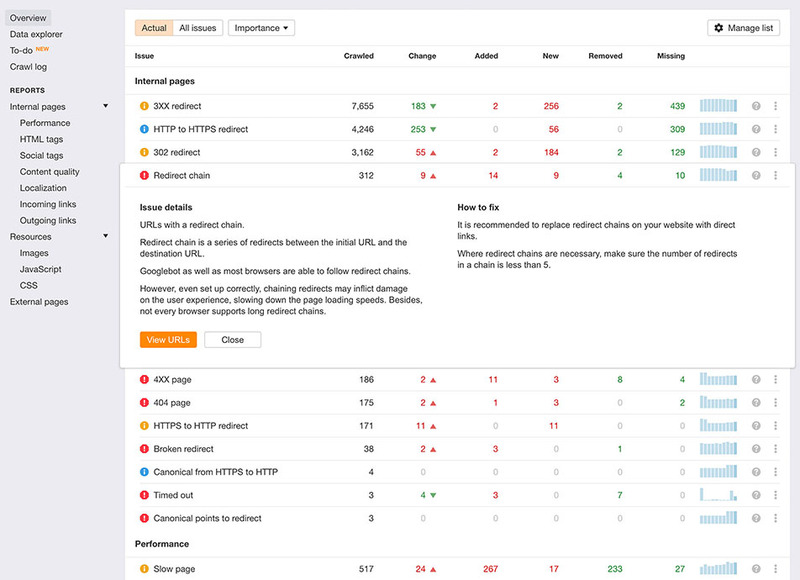 See under the hood of your website's on-page SEO performance. Stop guessing and find out exactly what’s holding your website back from ranking. 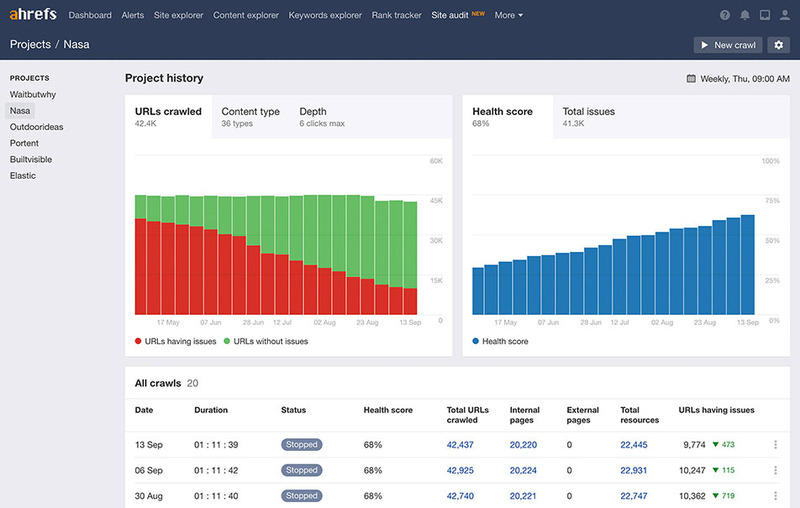 Site Audit crawls all the pages it finds on your website – then provides an overall SEO health score, visualises key data in charts, flags all possible SEO issues and provides recommendations on how to fix them. Have a huge website? Not an issue. Crawl it fast by verifying your domain and tuning the speed settings. Or skip crawling unrelated sections entirely by setting parameters to exclude and/or include certain website sections. 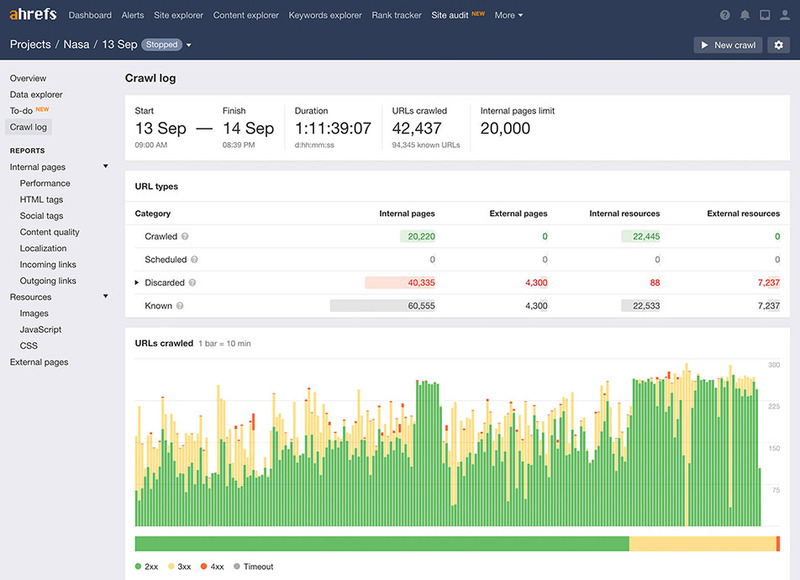 Watch the crawl of your website in real time. See all relevant data at a glance with multiple charts. Check against 119 pre-defined SEO issues with your domain and get recommendations on how to fix each one. Clicking on any issue shows you a list of the URLs affected. Site Audit automatically groups issues by type and pulls printable reports – all fully visualized with colored charts. 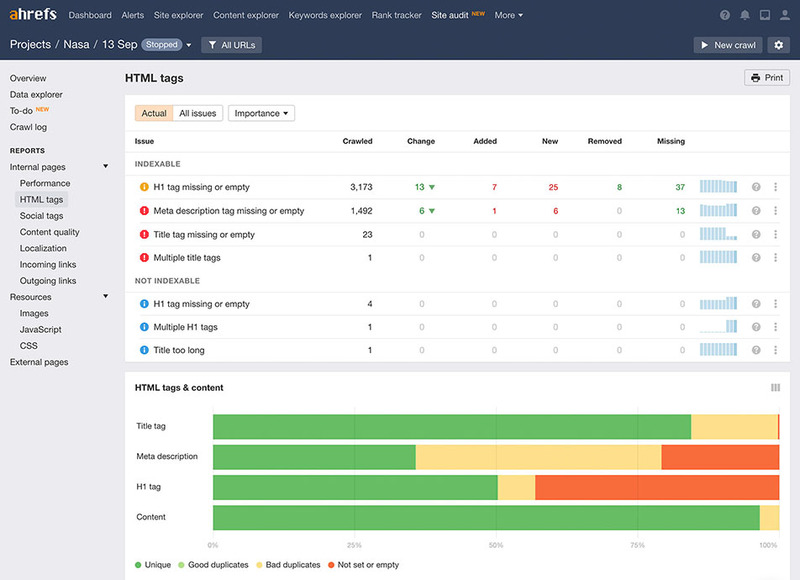 If you’re a skilled technical SEO who wants to go deeper than pre-defined issues, our powerful Data Explorer puts you in full control of over a hundred different data points on each of your pages. Make anything you want out of the data from our crawler – starting with creating custom filters based on numerous parameters, or adding custom issues. Then tell Site Audit what you want to see. From displaying data on a specific property for a segment of pages to screening it out entirely across every crawled page, Data Explorer does it all. 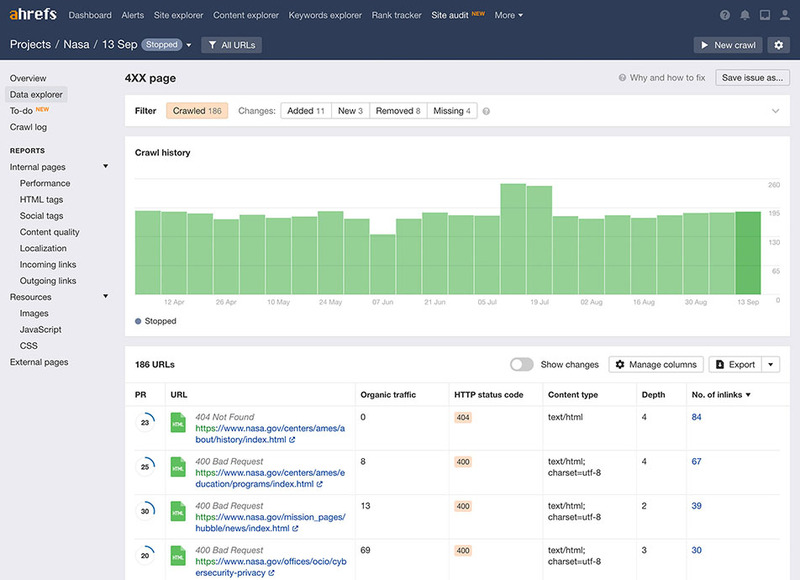 Note: Ahrefs’ backlink and organic traffic metrics are all integrated and can be enabled for display. No more cross-referencing data; you’ll have all the SEO metrics that you care about in one place. With Data Explorer, you’re a simple click away from seeing every detail of each specific URL. This includes incoming and outgoing links, hreflang, pagination, duplicates and resources. Schedule daily, weekly or monthly crawls for your projects – Site Audit will run these automatically and save each crawl. See updates in your progress in between crawls with a simple toggle, then export your data with a click. Stay on top of Google’s mobile-first indexing rollout. In Site Audit, you can choose to crawl the mobile version of your website by selecting from one of our pre-configured mobile user agents. 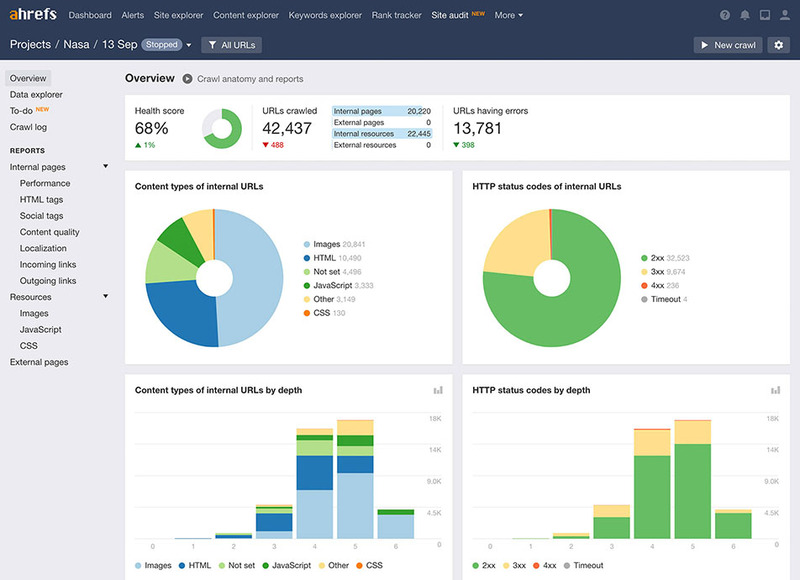 Start using Ahrefs' Site Audit tool and find out what’s holding your website back from ranking—right now!